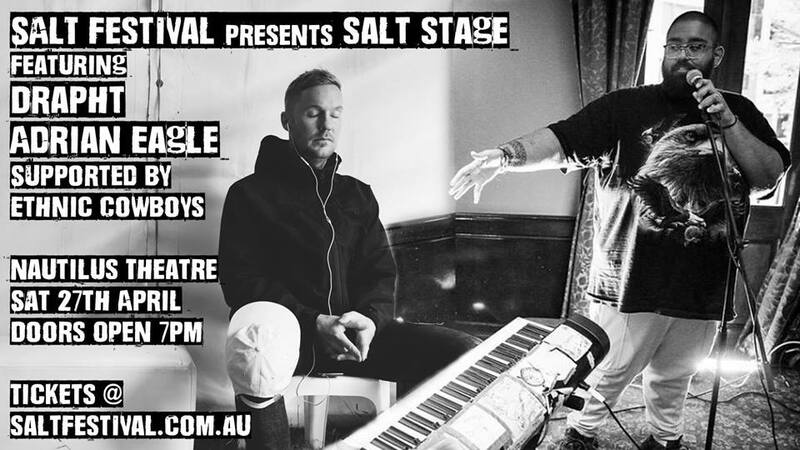 SALT Stage features DRAPHT and ADRIAN EAGLE, supported by ETHNIC COWBOYS. With a platinum record, multi-platinum and gold singles and two ARIA already under his belt, Drapht is a musical prodigy who demonstrates songwriting flair and linguistic dexterity. Each of his five subsequent albums – Who Am I (2005), Brothers Grimm (2008) and Life Of Riley (2010) Seven Mirrors (2016) and Arabella Street (2018) – brought increasing levels of complexity and refinement, ascending Drapht to the absolute upper echelon of Australia’s stacked card of hip-hop heavyweights. ADRIAN EAGLE is garnering widespread acclaim for his breakout single and video 17 Again. Adrian’s guest appearance on the legendary Hilltop Hoods ARIA Award winning single Clark Griswold and a massive national and international touring schedule made 2018 a landmark year for this emerging Adelaide bred singer-songwriter. Local band Ethnic Cowboys will bring their own hip-hop style to the event.